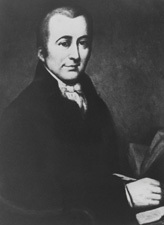 RODNEY, Caesar Augustus, (son of Thomas Rodney, cousin of George Brydges Rodney, and nephew of Caesar Rodney), a Representative and a Senator from Delaware; born in Dover, Del., January 4, 1772; completed preparatory studies and graduated from the University of Pennsylvania at Philadelphia in 1789; studied law; admitted to the bar and began practice in Wilmington, Del., in 1793; member, State house of representatives 1796-1802; elected as a Democratic Republican to the Eighth Congress (March 4, 1803-March 3, 1805); was not a candidate for renomination in 1804; one of the managers appointed by the House of Representatives in January 1804 to conduct the impeachment proceedings against John Pickering, judge of the United States District Court for New Hampshire, and in December of the same year against Samuel Chase, Associate Justice of the Supreme Court of the United States; Attorney General of the United States in the Cabinet of Presidents Thomas Jefferson and James Madison 1807-1811, when he resigned; served in the War of 1812; member of the Delaware Committee of Safety in 1813; member, State senate 1815-1816; was sent to South America by President James Monroe as one of the commissioners to investigate and report on the propriety of recognizing the independence of the Spanish-American Republics; elected to the Seventeenth Congress and served from March 4, 1821, to January 24, 1822, when he resigned; elected as a Democratic Republican to the United States Senate and served from January 24, 1822, to January 29, 1823, when he resigned; appointed Minister Plenipotentiary to Argentina in 1823, and served until his death in Buenos Aires, June 10, 1824; interment in British Cemetery, Victoria district; reinterred, 1923, in British Cemetery, Charcarita district, Buenos Aires, Argentina. Dictionary of American Biography; Read, William T. Biographical Sketch of Caesar Augustus Rodney. Wilmington, Del. : C.P. Johnson, 1853; Ryden, George Herbert. Biographical Sketches of Caesar Rodney (the Signer) Thomas Rodney and Caesar A. Rodney. Dover, Del. : Publica Archives Commission, 1943.